Providence College received a B.
Washington Monthly's ranking of 137 out of 224 of Affordable Elite Colleges - Overall Rank was a major contributor to this grade. At Providence College, where "you couldn't be 'just a number' if you tried," all students must complete a two-year interdisciplinary Western Civilization survey and an array of distribution requirements. Business, marketing, accounting, and education are some of Providence College students' preferred majors. What is a typical Providence College student like? Describe the type of person that should attend Providence College. What are the top 3 reasons someone should attend Providence College? What was a typical Providence College student like in high school? Describe the type of person that should attend Providence College. 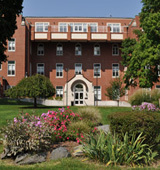 A typical Providence College student in high school was very involved in the school, joined a variety of clubs and activities while maintaining honors and high grades. Few schools can claim a more transparent admissions process than Providence College. The friendly student body is close-knit, and there's an undeniable sense of community on campus. Providence College is a primarily undergraduate, liberal arts, Catholic institution of higher education. Committed to fostering academic excellence through the sciences and humanities, the College provides a variety of opportunities for intellectual, social, moral, and spiritual growth in a supportive environment. The College actively cultivates intellectual, spiritual, ethical, and aesthetic values within the context of the Judaeo-Christian heritage. These values are nurtured by the unique tradition of the Dominican Order which emphasizes quality teaching and scholarship. Providence College recognizes the unity of the human family that proceeds from its one Creator. It therefore encourages the deepest respect for the essential dignity, freedom, and equality of every person and welcomes qualified women and men from all religious, racial, and ethnic backgrounds. Providence College prepares its students to be responsible and productive citizens to serve in their own society and the greater world community. What are the top 3 things that students do for fun at Providence College? Support our Friar Family at the Men's Basketball games downtown at the Dunkin Donuts Center! Try to win great prizes, like TVs or much needed Keurigs, at the Super Bingo events in Peterson! Campus housing is available for undergraduates. Housing deposit : $200.00. Housing deposit due : May 1. Housing deposit is not refunded if student does not enroll.. No cars. No pets. 78% of students live on-campus. A program that focuses on the scientific study of vision, visual processes, and related phenomena and clinical research and treatment modalities. Includes instruction in ocular anatomy and physiology, microbiology of the eye, electrophysiology, neurophysiology, corneal physiology, photochemistry, psychophysics, visual biophysics and motor systems, sensory mechanisms and photoreception, eye circulation and metabolism, geometric and physical optics, ocular development across the life span, visual stimuli and perception, color vision, eye motility, biometrics and measurement techniques, visual pathology, and environmental issues. Rev. Brian J. Shanley O.P. 95% of students graduated in the top half of their class. 37% of students graduated in the top tenth of their class. The average student pays $34,388 for tuition, fees, and other expenses, after grants and scholarships. Total stated tuition is $42,385, in-state and on-campus, before financial aid. 78% of students receive some form of financial aid. Learn more about financial aid at http://www.providence.edu/financial-aid/pages/default.aspx. Estimate the net price for you at http://npc.collegeboard.org/student/app/providence. 82% of students graduated on time. 85% of students graduated in six years. 91% of full time students continued studying at this school after freshman year. The typical (median) early career salary of Providence College graduates is $49,100, according to Payscale. Providence College participates in the NCAA Division I-AAA for college athletics. Want more info about Providence College? Get free advice from education experts and Noodle community members.